Journalist Jamal Khashoggi speaks during a press conference in Manama, Bahrain, in this Dec. 15, 2014, file photo. 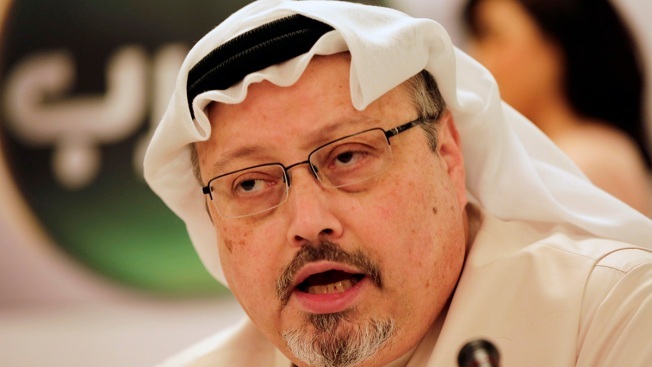 The "last piece" from missing Saudi journalist Jamal Khashoggi was published late Wednesday by The Washington Post, his editor announced in a note. Khashoggi has not been seen since visiting the Saudi consulate in Istanbul, Turkey, on Oct. 2. The New York Times reported that Turkey has recorded audio that indicates he was killed inside the consulate, and NBC News reported Wednesday that President Trump said he has asked Turkish authorities for this recording, "if it exists." Post global opinions editor Karen Attiah is convinced her colleague met a untimely end, writing, "The Post held off publishing it because we hoped Jamal would come back to us so that he and I could edit it together. Now I have to accept: That is not going to happen. This is the last piece of his I will edit for The Post." The journalist's piece addresses the lack of a free press in all but a few corners of the Arab world. Secretary of State Mike Pompeo visited Saudi Arabia's crown prince on Tuesday after concerns of missing journalist Jamal Kashoggi prompted calls for an investigation into the Saudi consulate in Istanbul, where Kashoggi was last seen. Kashoggi, a columnist for The Washington Post, was a frequent critic of the prince.